reveal the underworld scoop, a dual sensing Newton ball, and two custom Eddie sculpts. improved speaker cabinet and high quality JBL branded backbox speakers. powerful than audio systems of previous generations. commercial, and corporate markets around the globe. the fun and learn more, please visit www.sternpinball.com. 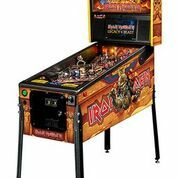 and features the art & music of Iron Maiden. released globally on November 19th.